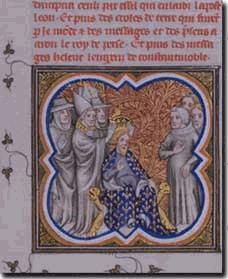 Until now the international scientific world has treated as holy writ such Western chronicles as for example the work of Einhard about the life of Charlemagne. Despite the obvious absurdities practically every statement, every half sentence was taken at face value. This is the very same international scientific world which ignores in its entirely the medieval Hungarian chronicle literature and brands it from the viewpoint of historical science as untrustworthy. On what basis? Why are our historical scientists using such double standards in this matter? Why is a medieval Hungarian chronicler more untrustworthy than a Western counterpart? We know the answer: due to reasons of chronology. Namely, the official academic argument goes that the medieval Hungarian chronicle literature, which derives altogether only 104 years between the death of Attila and the Magyar reconquest, is guilty of such obvious stupidity that it is impossible to take it seriously from a historical-scientific point of view and accept its claims as trustworthy! Do we understand this? Our Lord Jesus Christ was also sentenced to death because when asked by Caiaphas he stated the truth about himself! They treat the Hungarian chronicle tradition the same way: the reason they don’t take its statements seriously and consider it untrustworthy from a historical-scientific point of view is that it states the truth! Because it courageously and simply leaves out – skips – the fictitious period which probably was smuggled retrospectively into history. The possibility that maybe the problem is not with the statements of the Hungarian chronicles after all, but that the chronology itself is incorrect and that some flaw slipped into our chronological system has so far not entered our scientists’ minds. In a word, according to Constantine Porphyrogenitus at that time the Hungarians were the loyal subjects of the Jewish Khazar king, but we did not have enough brains to elect a leader for us among ourselves. The Khazar king drew our attention to the fact that it was high time we too had a chieftain. He asked Lebediás to lead his “hordes” and that he be the ruler of “his race”. But since Lebediás was a humble person, he referred this honouring request to Álmos and his son Árpád. This would then be the genesis of the noble royal house of Árpád, according to Constantine VII Porphyrogenitus. Naturally, our master forger does not miss the opportunity to emphasise that before Lebediás the Hungarians did not have a chieftain! He does all this obviously due to the ulterior motive of forcibly separating the Magyars from Attila the Hun, the Scourge of God, who, in the 5th century, at the head of his immense armies could force even the Roman empire down on its knees. In face of this, the Hungarian chronicles know of neither Lebediás nor the Khazar king nor indeed Khazaria! They do talk, however, of Scythia and call the Magyars alternately Huns or Scythians, and, where Attila is concerned, talk of him as a Hungarian king. To all this let us also add the statements of Heribert Illig, according to whom one of the originators of this medieval calendar forgery is none other than Constantine VII Porphyrogenitus, whose statements concerning Hungarian history the Hungarian historical-scientific community has uncritically accepted. To this I believe no further comment is necessary. Published: March 11, 2008, by Kartavirya | This entry was posted in Metahistory. | Bookmark the permalink. Post a comment or leave a trackback. I would like to point out some weak points of this thesis. First, Islam was not started with the flight of the Prophet Muhammad (on whom be peace and benedictions) to Medina, but 13 years earlier in Mecca. This is well established in the history of Islam. Second, and this is well established as well, the reason for the Prophet’s flight (peace and blessings be upon him) was not fear of christian persecution, as indeed christian presence in Arabia was quite limited, although it existed, but rather the necessity to preserve Islam and its followers from the persecution of the polytheists in Mecca, who disbelieved the monotheism taught by Islam, as it also went against their economical interest: the Meccans gained much profit from the fact that their city was the centre of pilgrimage for all Arabia, and in its sacred precinct there were 360 idols, which were adored by the different Arab tribes. Go back to the One God preached by Abraham and Ismael (peace be upon them), and you will lose the money gained from the pilgrims. 2) that these religions have a common source (God), so they share what is true in them, while their differences are because of men who have corrupted and altered the original teachings. They are both possible explanations, but I incline more to the second: it is stronger from my point of view, and this would entail that the Arian “heresy” is not a heresy at all, rather it is closer to a correct understanding of Jesus’ (peace be on him) teachings, confirmed by the later revelation of the Quran from God. There are studies pointing to this, based even on the Bible, and I suggest the book “Muhammad in the Bible” from Prof. Abdu ‘L-Ahad Dawud, former Bishop of Uramiah. It can be found on the web and downloaded. 2) it is not strong enough if it is not corroborated by numerous other proofs for the validity of the general theory “Islam comes from Arianism”. 2) many early converts to islam were Christians and Jews who saw in the Bible prophecies confirming the prophethood of Muhammad (peace and blessings be upon him). In fact, it could be said that one of the firsts to know that Muhammad (peace and blessings be upon him) was a Prophet was a Christian monk called Bahira, who based his deduction on what he found in the Scriptures. This probably goes back to the book I mentioned earlier, “Muhammad in the Bible”. It is possible that the Patriarchs had the same conviction. There are muslim sources attesting that the Emperor Eraclius believed in Muhammad’s (peace and blessings be upon him) prophecy. I pray that God guide us all to what pleases Him the most, gives clarity to our minds and hearts and show us the Truth whatever it may be, making us gladly accept it. And may He forgive me for any wrong thing I said. When man is imprisoned like this in life and in the conceptions directly connected with it, he can know nothing about what escapes from change, about the transcendent and immutable order, which is that of the universal principles.